I want to start this pre-election post by reminding you to vote tomorrow, November 4, if you have not already done so. Remember that if you choose not to choose, you still have made a choice. Make your choice count! Secondly, I want to give my personal testimony about the Fairbanks emergency levy renewal and addition which comes before the voters this election season. I urge you to join me and please vote "yes" on the school levy. As a resident of the district, a parent of two Fairbanks students, and as a faculty member on our fine staff, I have a unique insight into the state of our district. I can attest that the quality of education provided here is one of the finest around. Districts of comparable size in central Ohio can't hold a candle to the expertise of our faculty and the educational atmosphere present here at Fairbanks. I can, however, also attest that the Fairbanks Local Schools do not provide many frills. We survive daily with old computers and little to no district-funded supplies. Funds for field trips are usually funded by student activity (fund-raising) dollars. Computers are made to last much longer than their functional lifespan might allow, and many are second-hand. Teacher salaries, while relatively high for beginning teachers, are quite a bit lower than neighboring districts for highly-experienced teachers. Our student-to-teacher ratio is relatively high and our cost-per-pupil is relatively low. With only one administrator per building, our administrative salaries are lower than most districts of similar size. In a few words, we have a frugal and effective district. I can assure you that the money spent here at Fairbanks is spent well and none is wasted. The amont of the additional millage will only cost the owner of a $100,000 house just over $60 next year. Please consider how little money this is to ensure all of our students continue to receive the high-quality education provided by the Fairbanks Local Schools for decades. 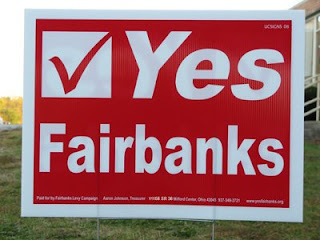 I hope that you all appreciate the special place and atmosphere that Fairbanks holds. In my humble opinion, you just can't find a better value for your money. I plan on voting "yes" because our students deserve the best education we can provide and I have every confidence that the board of education, treasurer's office, and superintendent manage this school and its finances well. Won't you join me with your "yes" vote as well? If you have any questions about this levy, what it means to our district, and how our schools compare to similar districts and neighboring districts, please read this complete and concise document.